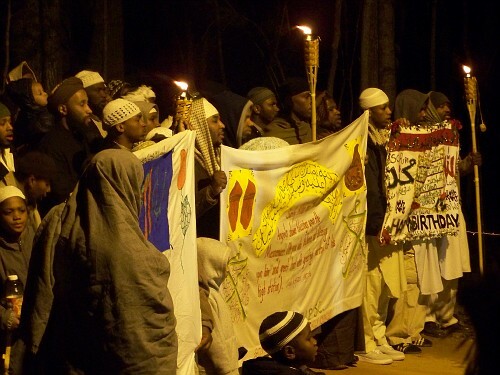 Hundreds of pilgrims travelled to Holy Islamville, South Carolina, to commemorate one of the most important holidays in the Muslim world, the Milad un Nabi or the birthday of the Holy Last Messenger, Muhammad (peace be upon him). Guests from other faiths joined the Muslims of the Americas in the commemoration and celebration, which took place at the fourth holiest place in the world, the Holy Khanqah Qadiriyya Gilaniyya. Hundreds of pilgrims travelled to Holy Islamville, South Carolina, to commemorate one of the most important holidays in the Muslim world, the Milad un Nabi or the birthday of the Holy Last Messenger, Muhammad (peace be upon him). Guests from other faiths joined the Muslims of the Americas in the commemoration and celebration, which took place at the fourth holiest place in the world, the Holy Khanqah Qadiriyya Gilaniyya. The Holy Khanqah is located in the lovely country-side of York, South Carolina, where a historical miracle took place in 1996 during a ladies winter camp. Muslims, Christians and people of other faiths have been coming here to engage in secluded moments and prayer ever since. This year, the commemoration of the Milaad un Nabi (The Messenger, Muhammad’s zpeace and blessings be upon him) began a few days early as to include a commemoration for Hazrat Mian Mir (God’s mercy be upon him) as well. Poetry, songs, hadiths and stories could be heard throughout the village. Children in beautifully, multicolored apparel could be seen going about rehearsing for the many competitions and participating in the various activities. Holy Islamville was elaborately decorated with hundreds of holiday lights, flowers, tinsel and garlands elaborately intertwined around the trees and draped over the homes and buildings, all of which added more to the aura of love and honor for our dearly beloved Messenger (Peace be upon him), the King of All Creation, the One gifted with the Best of Manners and who has the Greatest Capacity for Love! The Messenger Muhammad’s birthday (Peace and blessings be upon him) is especially set aside in the Muslim world because Allah Himself and the angels so honored him. “…Verily Allah and His Angels send blessings on him…” (Holy Quran, 33:55) No Muslim denies this. Allah the Most High further continues by commanding “…Oh Ye Who Believe! Send send blessings upon him with peace…” Do we find ourselves in obedience to this command and hoping and praying that we will receive the same salutation from our Lord? Allah has shown us how to honor our Messenger (peace be upon him). The Almighty has left us with a manual for life directing us on how to live and navigate through everything. Yet, in the Holy Last Messenger we have the practical example, in the way he lived, to demonstrate how to follow that manual. Though we constantly send salutations upon him in are daily lives, the Milaad un Nabi is a time when communities gather in Love, throughout the world and send these salutations and blessings all at one time. We display this in many ways; by reciting poetry, we singing songs, and reciting Holy Qur’an all night long. We design banners and have parades to show our love, for the Mercy of the Worlds, we decorate our homes and buildings to show our love for the Mercy to all the Worlds, we read the entire Holy Qur’an in group settings to show our love for the mercy for all the worlds and we complete the book of prayers upon the Holy Last Messenger, Muhammad (peace be upon him), Dalaail ul Khairaat in groups. The compilor, Hazrat Jaazooli, had intense burning love for the Holy Last Messenger, Muhammad (peace and blessings be upon him) and this intense love in the form of salaams is on constant repeat and replay. Reciting the verses in this blessed book is the speedy methodology to gaining the love and attention of our Blessed Messenger Muhammad expeditiously (peace and blessings be upon him forever and ever). Allah willing, the Muslims of the Americas by the thousands, who have up to five generations dwelling in its Muslim villages with Holy Khanqahs, mosques, zavias and Islamic academies, will continue with this love on a daily basis and annually gaining and longing for his love and mercy until we meet with our Beloved. Driven by love, we set out for Sufi Lodge #2 in Holy Islamville, SC. On an early Thursday morning. We were headed towards a holy gathering hosted by Allah., Most High in honor of His beloved, the Holy Last Messenger (peace be upon him) – a wonderful invitation!